Oomph! (‘Our Organisation Makes People Happy!’) design and run fun, interactive, group exercise classes within care homes and in the community. Its specialist exercises are based on expert methodology, and use reminiscent music and simple routines to deliver physical and mental health benefits. So far, Oomph! 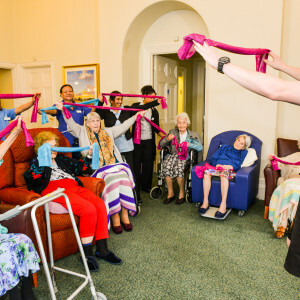 has delivered 7,000 sessions in over 600 care homes. Oomph! is rapidly expanding and now licensing its proven methodology to some of the biggest names in the care sector: including Bupa, Hallmark and Ideal Care Homes. The World Health Organisation states that regular exercise improves cardio-respiratory and muscular fitness, bone and functional health and reduces the risk of diseases like cancer, depression and cognitive decline. Yet only 7% of adults aged over 75 in England get the minimum recommended levels of physical activity.